The proposed regulations would exempt amateur athletes from vacations, paid public holidays, minimum wage, hours of work and weekly rest periods and protection with respect to dismissal and termination of employment. The Canadian Hockey League Players' Association is shocked with the New Brunswick government's plan to exempt amateur athletes from minimum wage laws, paid holidays, vacation and protection from being fired. "I'm furious, there's no way this should have come to this point," said Randy Gumbley, a spokesperson with the association, who believes all players should be protected and have a right to earn minimum wage. "This is like slave labour." Labour Minister Donald Arseneault announced the planned exemption from minimum employment standards Wednesday in Saint John and said the changes are positive for amateur athletes and their teams. "Each team contributes to the social fabric of its community in a meaningful way, while also providing numerous positive economic spinoffs and benefits," he said. The league argues paying minimum wage to players would make teams unsustainable. It says most teams pay expenses to players and operate with an annual revenue loss. Arseneault said these proposals to the Employment Standards Act will save each team around $380,000 on an annual basis. "These will allow them [the teams] to be financially viable so that they can continue to operate and grow. And by ensuring the team's ability to continue operating, it will allow amateur athletes to gain invaluable experience that could be the gateway to a prosperous professional career in hockey or other sports." In New Brunswick, there are three Quebec Major Junior Hockey League teams that would be affected by the regulatory changes. Nova Scotia, Saskatchewan and British Columbia employment laws for amateur athletes are like those New Brunswick plans for amateur athletes. P.E.I. is also considering similar changes. The New Brunswick plan will be open for review for 30 days. Right now, Gumbley said amateur players in New Brunswick are not paid very much. "If you have a student working at McDonald's and flipping burgers and earning a trade, what's to say McDonald's can't say, 'Well he's earning a trade to be a cook, we don't have to have a right to pay him?'" he said. The proposals come in the middle of a bitter battle to grant minimum wage to junior hockey players. A looming class-action lawsuit against the Canadian Hockey League and its umbrella leagues is seeking $180 million for current and former major junior hockey players to cover wages, holiday and vacation pay. Gumbley said it's appalling New Brunswick's government would get involved in the middle of the litigation and he concluded Arseneault was moving ahead without looking at the facts. "It's a disgrace that a minister … gets involved in the middle of this," he said. "He should bury his head in the sand. "These players are actually employees, they should be subject to minimum wage laws and be protected." Lukas Walker, who played for three years in the CHL, says changes are needed to make contracts more fair for major junior hockey players. (CBC)Former player Lukas Walter, who spent three years with the Tri-City Americans and the Saint John Sea Dogs, said he'd just like to see players treated more fairly. "I lived the dream," he said in an interview with CBC News earlier this year. "It was fun. I loved playing hockey and all that. But you've got to think past hockey sometimes. And you don't think about that when you're at the rink." 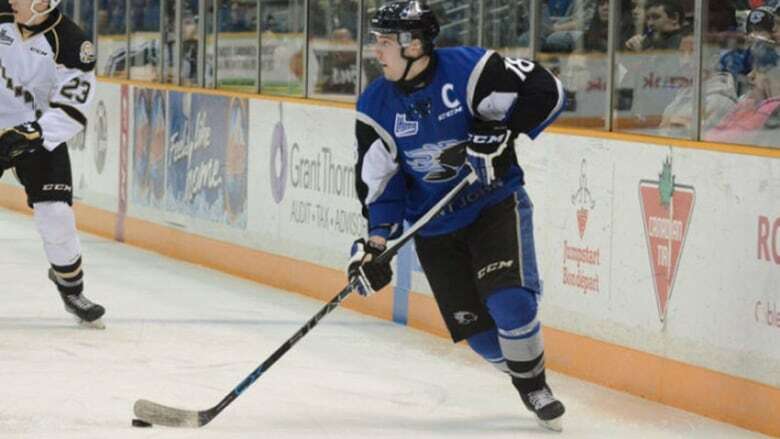 Trevor Georgie, the president and general manager of the Saint John Sea Dogs, suggested in a government news release that the province showed "great leadership" in changing the rules. "We are committed to provide the support both on and off the ice," said Georgie. "We do this while providing much needed financial support for an education, taking in young boys and helping turn them into young men." Georgie said the whole league and the CHL did the same. "Most provinces who have reviewed the matter have confirmed that our players are not employees and have granted exemptions. And we are thrilled that our province is part of that leadership group." Georgie said the Sea Dogs operated at a financial loss last year. "It's not a job. These are amateur athletes, these are student athletes." But Gumbley said this sets a dangerous precedent for the rest of Canada and the United States, when "for-profit businesses" say they can't afford to pay players. "Well then you know what? You shouldn't be in business," he said.